For auto body repair in Santa Rosa Ca, there is one industry leader – Guanella Auto Body. Often there is enough stress in having to have an automobile repaired so Guanella Auto Body wants you to be at ease with our services. We’ve been doing auto body repair in Santa Rosa CA since 1978 and the customer services below give you a complete care from beginning to end in taking care of your situation. We do not owe our business to insurance companies. Our business is based on giving the highest quality services to our customers who are our best spokesman. We know our reputation is how our business thrives so there is only one way to keep our reputation high. We do every aspect of our interaction with our customers to the highest standards. You do not have to wait to get our free estimate or use our 24 hour towing. We work with Enterprise Rent-A-Car and have cars available to rent. We handle all claims dealing with the insurance company. 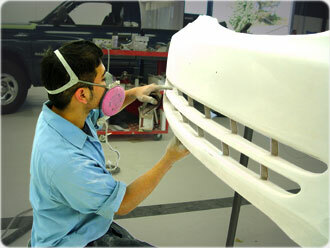 Our technicians for body work and paint are factory trained. We include services such as Glass and windshield repair and suspension alignment and we’ll return your car with complete detailing including complementary wash and vacuum before delivery. And you are backed with a Limited lifetime warranty. You see, when your business depends on your work, then every detail needs to be right. Some other auto body shops are living on the whim of an insurance company. They may not want to lose the business steered their way from the insurance company. But if you think about it, there are some drawbacks in service with this traditional model, mainly that the customer is no longer coming first, the insurance company is who many auto body shops are out to please. If you, the customer, want to be of prime importance then for Auto Body in Santa Rosa CA and surrounding area, you will want to check with us at Guanella Auto Body before you make a decision.